Bowlmor Lanes Cupertino is not your grandfather’s bowling alley! 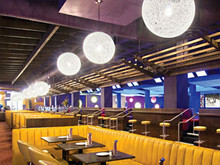 This unique, high energy venue combines upscale bowling, gourmet cuisine by celebrity Chef David Burke, and award-winning service for an unforgettable entertainment experience. A great location for everything from stylish nights out with friends, corporate gatherings, and children’s birthday parties, Bowlmor Lanes is the South Bay Area’s ultimate entertainment destination! 32 lanes of luxury glow-in-the-dark bowling are only the beginning at this Cupertino hotspot. The chic venue features a full service restaurant serving innovative American cuisine by Top Chef Master’s David Burke (also available right at the lanes). Bowlmor’s giant sports bar, with HD media wall and real time sports ticker, is a Cupertino gem and features a great Happy Hour serving half priced cocktails Sunday- Friday. Bowlmor’s pulsating atmosphere, complete with video screens on the walls and a top-notch sound system gives crowds a total sensory-overload! Bowlmor Lanes specializes in Private Parties of all types and sizes. Their team of professional event coordinators handles the entire party planning process and customizes each event. Centrally located, Bowlmor is the perfect for Corporate Holiday Parties, Teambuilding Events, Client Entertainment, Adult Birthday Parties, Kids Birthday Parties, and so much more! 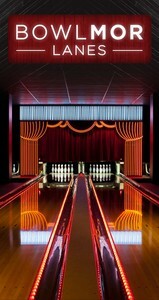 Bowlmor guarantees that each and every event is a STRIKING success. Call today to get the ball rolling on your next party! 32 lanes for glow-in-the-dark bowling offer a stylish and exciting experience. All lanes have big screen video walls, and the top-notch sound system pumps out the hottest beats. Bowlmor Lanes offers a full-service restaurant with lengthy menu of flavor-packed favorites and creative dishes. Watch the game while enjoying a cold beer or a cocktail at the sports bar.